So many children are naturally attracted to water as a source of play and work. 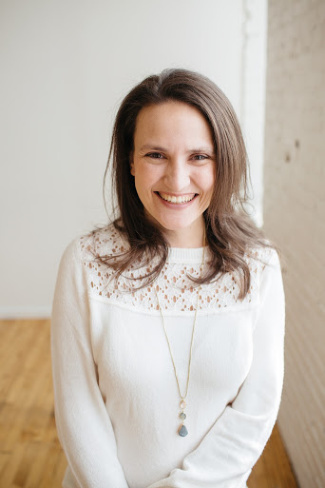 In Montessori, we make no distinction between a child's "play" and "work." They are one in the same. We respect a child's exploration and provide opportunities for meaningful contributions to the child's environment. Many of these contributions include the freedom to work with water. 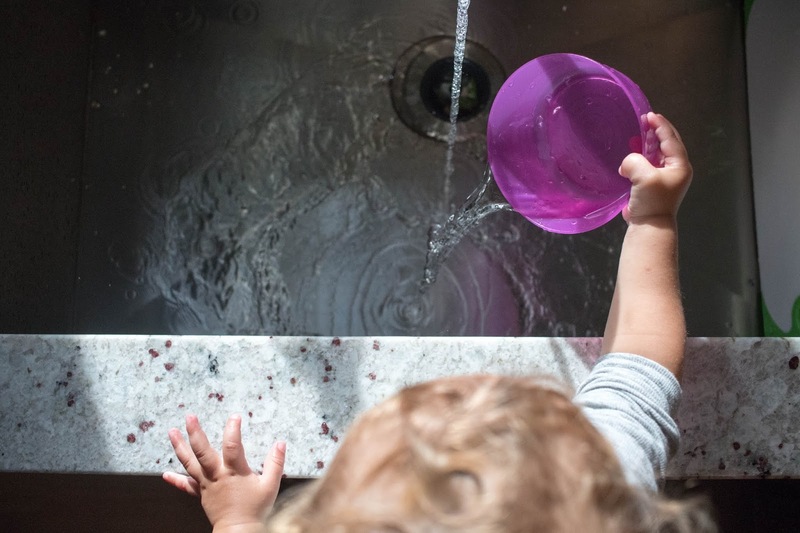 I've talked before about the importance of offering water to your child, and it's connection to independence. At 21 months, a lot of the work that Augustus chooses has to do with water. Not only is it a sensory rich experience, but much of the work is practical which makes it even more appealing to a toddler. 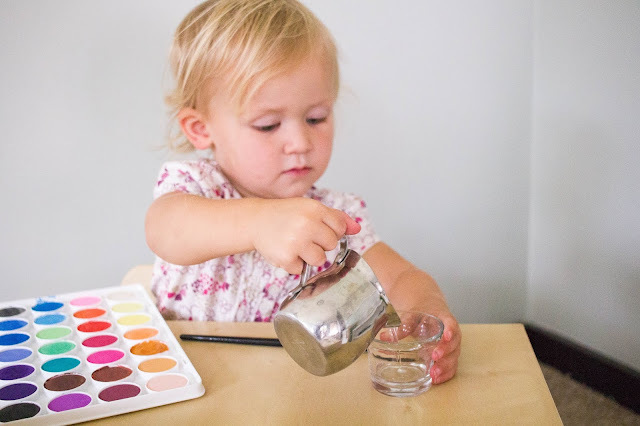 Here are some Montessori ways that we play with water in our home! 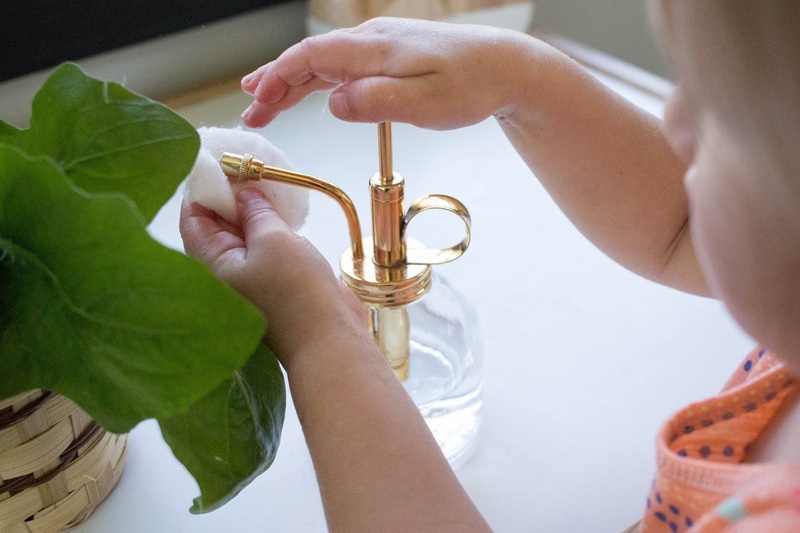 Washing hands - this one is very popular with all of my kids as babies and toddlers. 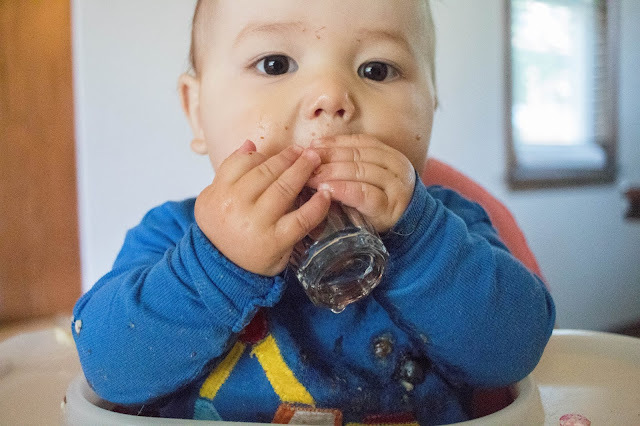 Nora and Gus could both spend up to an hour washing their hands over and over again in their children's sink. Watering with droppers - this is great for plants that don't need a ton of water but that children like to give attention to. 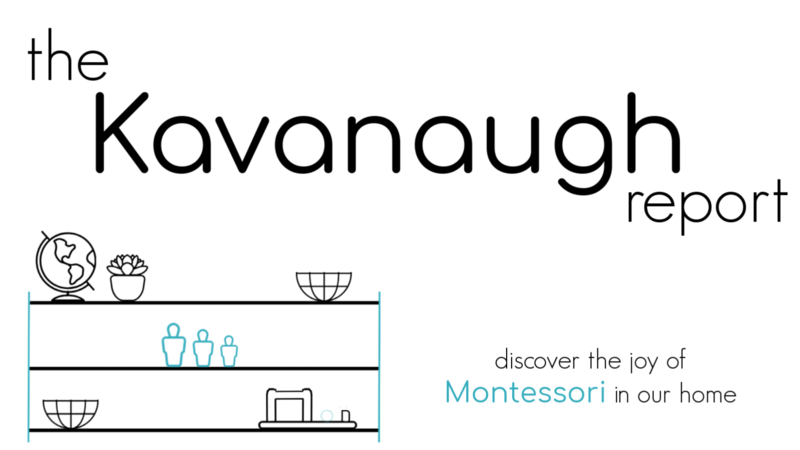 This is another huge area in Montessori environments! Learning to care for yourself or someone else is an important step on the journey to independence. And, just so appealing to young children. Again, the younger the child, the less complicated/independent these will be. 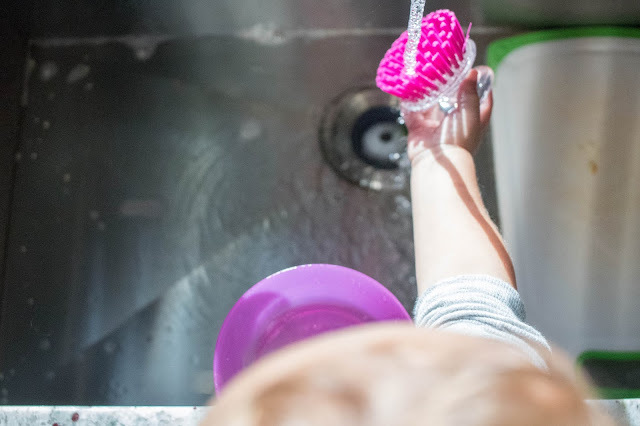 Washing a baby doll - washing a small hard baby can be a great way to help practice some of the practical life skills that young children are learning. 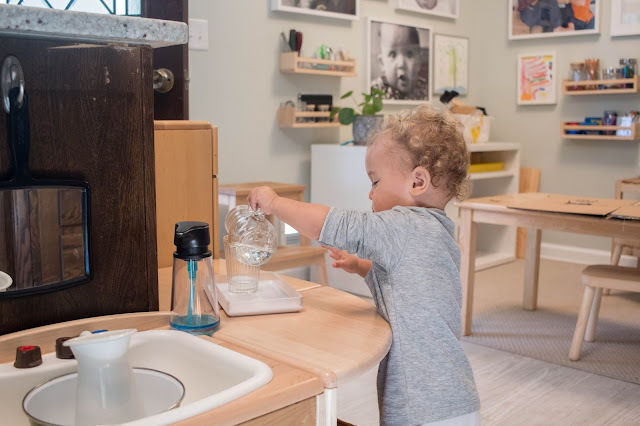 There are so many different Montessori transferring works that can include water. 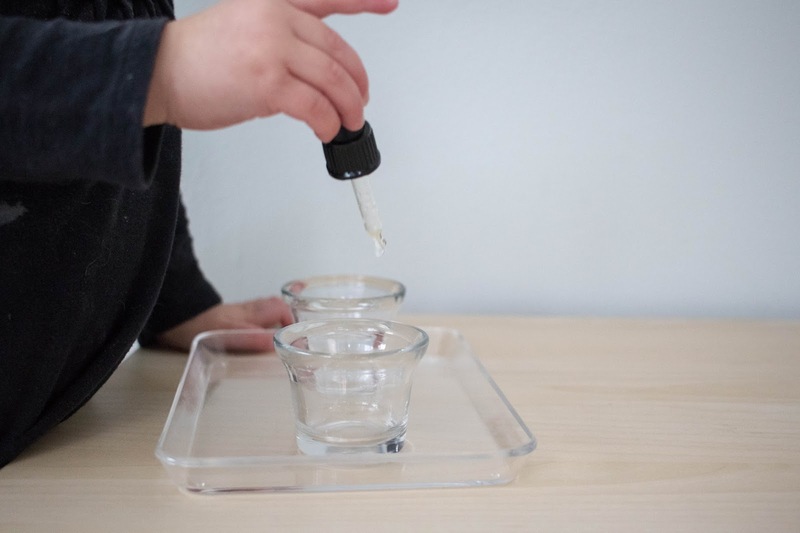 Here these are often set up on little trays that allow a child to move water (or something in water) from one bowl to another. These trays can be particularly attractive to 3-6 year old children who are learning to refine their fine motor skills, and many will be present in Montessori classrooms at this age. For toddlers, these trays often lead to a bit of a mess. They can be fun from time to time, but toddlers generally are much more interested in real and practical experiences (actually pouring a drink, for example). Pouring - pitcher to pitcher, pitcher to cup, tea pot to cups, larger pitcher, small pitcher! The possibilities are endless, you just need some creativity! 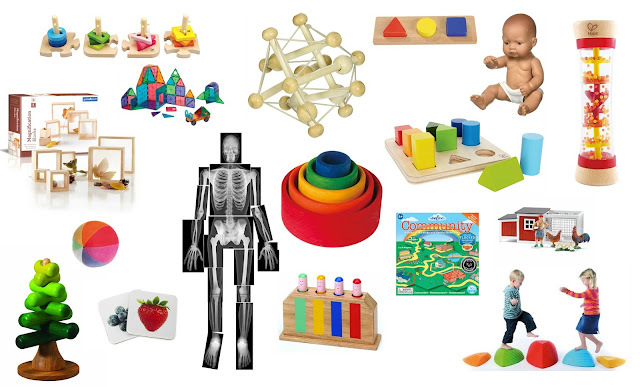 Some of these may be more Montessori inspired or Montessori friendly and wouldn't necessarily be found in all Montessori environments. 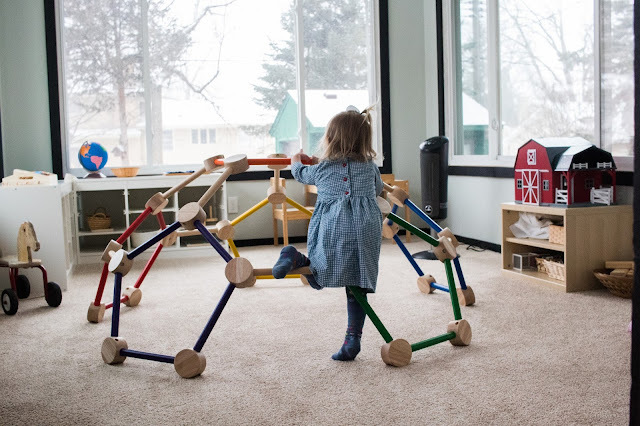 But, these can be fun additions to a Montessori home. Art - From watercolors to using a Buddha Board, there are so many possibilities here too. Playing in the rain - And of course, just get outside! 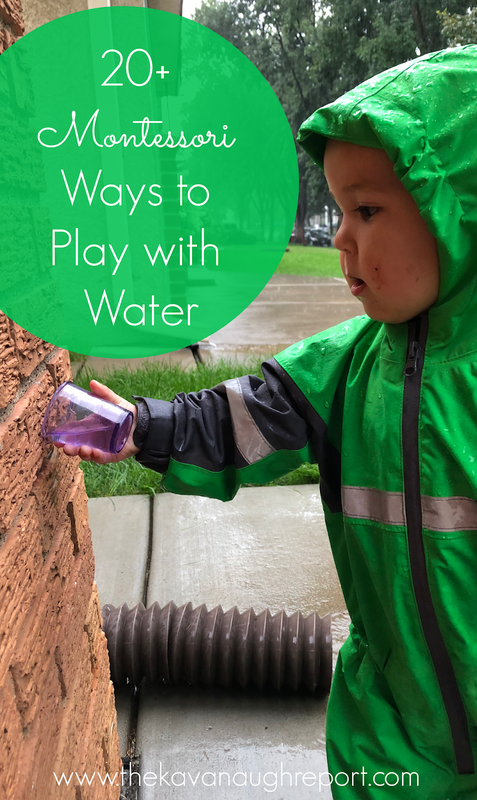 Kids will find so many opportunities for play and exploration when the weather may not be "perfect"
How do you incorporate water play into your home? What does your child enjoy?